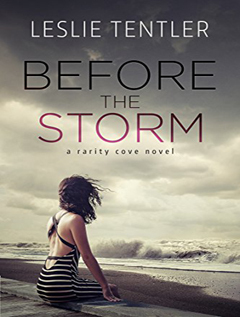 Leslie Tentler presents Book 1 in the Rarity Cove series. When she closed her eyes, she was back in that apartment again—shivering, shards of glass around her, her hands stained with blood . . .
Mark St. Clair lost his wife two years ago in a tragic accident. Head of the grand St. Clair resort, he distracts himself from his lingering grief by running the family business and caring for his troubled young daughter . . . until a beautiful restaurateur sets up shop in town. As Samantha and Mark begin a hesitant courtship, double perils emerge. Someone from Samantha's lurid past comes calling, threatening to expose her. And a powerful hurricane is forming in the Atlantic with the small beach town in its path. Trapped in the storm by the brutal man who wants vengeance on Samantha, she and Mark must fight for their lives.